Whitten is 51/2 months old and he has been sitting up for the last couple of days. He is loving the new view of the world!! He is such a sweet baby!! As you can see from the drool on his clothes, he will probably have teeth coming shortly!! Whitten loves jumping on the back of my parents couch. Every time the dogs walked by he practically jumped to touch them. I had Katie stop so Whitten could pet her. He loved it and he got so tickled every time he touched her. I think he is gonna be an animal lover like the rest of us!! When we were visiting Sittie and G-Daddy's house, Vaiden spotted a box turtle in the yard. He ran to pick it up and wanted to play with it. He couldn't understand why the turtle wanted to hide in his shell and not play with him. After waiting for several minutes, for the turtle to come out to play, Vaiden finally gave up and then put the turtle back out in the yard. We spent some time in Canton this weekend with my family. Dontcha love to see my "casper" kids next to my tanned brother and sister?? Granted they did just get back from a trip to the Virgin Islands, but it's still not fair!! Michael and I have been blessed with two sweet, beautiful boys. They have both been great babies!! Whitten loves smiling and will do so at the drop of a hat!! He is growing up so much. He is about to sit up all on his own. He has also learned to get on all fours~crawling to be announced!! We love him so much!! Our friends, Joey and Betsy Tompkins, just welcomed their second child, Joe Reed. He was born in June and weighed 10 pounds 6 ounces. He is so precious!! Joey and Betsy also have a daughter, Molly. She and Vaiden are only 3 months apart. They play so well together!! Whitten had to miss this meeting of his new bud because of a little cold, but hopes to meet his buddy Joe Reed real soon!! Since moving to Oxford, this is Vaiden's everyday ritual. He is outside playing hard with the other kids. Michael and I love watching him. He gets so hot, sweaty, dirty, and cut up everyday. Just look at those legs and knees. He also begs to take his shirt off (a boy thing??) He truly is all boy and loving it!! Since we have moved to Oxford, Vaiden has been playing like crazy with the other kids in the neighborhood. Vaiden is only 3 years old, but he acts and is as big as a 5 or 6 year old. Well, his best little buddy here in Oxford, got his training wheels off of his bike last week. Vaiden has begged Michael to take his off too, but we just didn't think it would be a good idea. Well, he finally convinced us today to give him a try at it. Needless to say from looking at these pictures, he can now ride his bike without training wheels!! It is so fun to see him so proud, but yet so sad to see him get so big!! We celebrated our first Fourth here in Oxford. We had a great day!! We ate dinner at a neighbors house, then went to the grove for music and space jumps. Later that night, we watched the fireworks over the baseball stadium. It was so much fun and the kids had a blast. To my suprise, Whitten didn't cry watching the fireworks. He sat in a friend's lap and watched every one with such awe. Before leaving Flowood, we had to say "See ya later" (Not Good-bye!!) to some of our dearest friends. Sims and Vaiden met when they were a year old. Angela and I became great friends too. Vaiden loves his buddy Sims!! We also had to say "See ya later" to Grant and Katherine. We met them at the Flowood Library and it ended up that we all lived in the same subdivision (the kids were around a year old). Alicia, Kelly, and I became great friends as well. 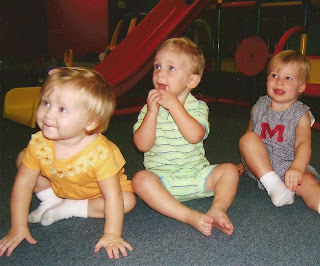 This was our "play group" and we did so much together. We have been great friends ever since. It has been so much fun watching these kids grow up together. They play and fight like brothers and sisters. Here are pictures of them then and now. Michael got a new job and started work in January. He lived with his parents and drove to work in Batesville everyday. We decided to build a house in Oxford and we started that process in November. Vaiden and I stayed in Flowood so he could finish Mother's Morning Out school and swim school. We saw Michael on the weekends and it was hard. In the meantime, Whitten was born in February and Michael drove 96mph from Memphis, TN to Jackson, MS to make his birth. Michael made it to the hospital in time and Whitten was born. We sold our house in Flowood within 3 weeks of it being on the market, so we loaded up and moved to Oxford Memorial Day Weekend. We have loved Oxford so far. We are just now getting settled into the new house. Vaiden has loved it here too. He plays outside all day everyday. Our neighborhood is awesome. The neighbors are true neighbors and friends. We look forward to growing and raising our family here in Oxford.